The central door locking failed on my 1996 Griffith 500 so I decided to trace the circuit to identify the fault. When the alarm module is deactivated by the key fob it sends a negative unlock pulse to pin 3 of the CDL relay. The CDL relay converts this incoming negative pulse into a positive pulse at pin 2M to unlock the door motors. During locking the alarm module sends a negative pulse to pin 2 that feeds a positive pulse from pin 1M to lock the car. ​With the ignition on if both doors are locked the limit switches on the door lock motors cause +12 volts from the ignition feed to illuminate the doors locked LED at the extreme left hand of the dash. Normally the doors would remain unlocked with the ignition ON but some alarm systems can lock the doors if preferred as a security measure. The LED indicates the status. ​The door switches send an earth (0 volts) to the alarm module when either are open which would sound an alarm (siren) if the alarm is activated. The CDL relay is rather more than just an electromechanical relay as it contains electronic circuitry to convert the incoming negative pulse into a positive pulse to operate the door lock motors. In addition its hefty relay contacts provide some measure of protection for the alarm module as they effectively isolate the alarm module from the door lock motors. The lock motors in the Griffith require an industry standard positive pulse of 0.8 seconds, this may have to be set up within the alarm module as there are several different standards around dependent on the vehicles design. I eventually traced my problem to the Meta alarm module. It was sending a decent unlock pulse of -12 volts to the CDL relay but the lock pulse was only about -5 volts which resulted in the car staying locked. The solution was to replace the now 20 years old Meta system with a Sterling Toad alarm/Immobiliser. ​The toad is remarkably similar to the original Meta but much more compact as both the alarm and immobiliser are contained in one small package. The Toad also allows remote boot opening by the addition of a simple relay. There are several inexpensive alarm systems on the market but few show detailed specifications. The toad is fully specified and has much larger immobiliser relays than the old Meta, the remote key fobs also operate from a much greater distance. It would seem to offer very good value for money. ​The circuit above applied to my 1996 500, earlier cars could well be wired differently. 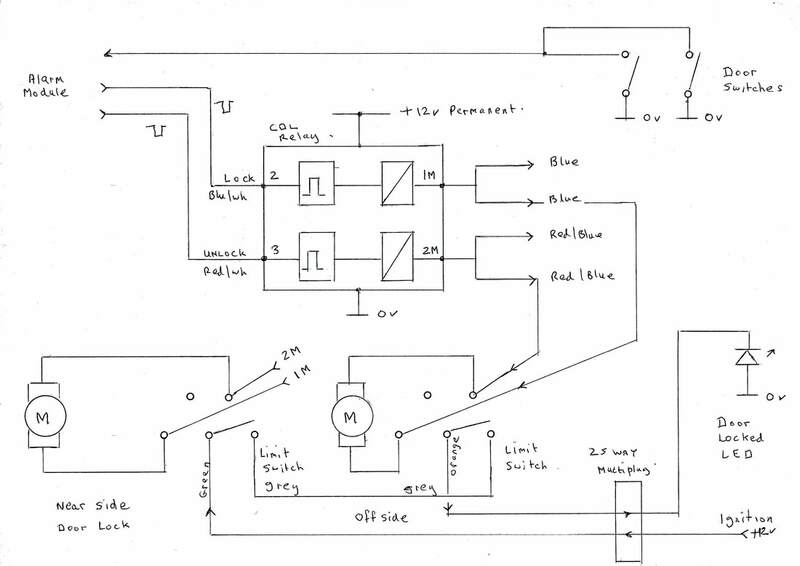 Apparently TVR originally devised their own CDL module that Steve Heath illustrates in his schematic. Unfortunately I have no details of that arrangement apart from guessing that the alarm lock/unlock signals would still need to be negative going and 0.8 seconds in duration.